Sea, Sand & Sky: Four Out of Five Times this Week! Another week has passed at Save the Harbor. It was a typical week here with the different sites except one. This week All Access added an extra day on to its weekly trips to the Boston Harbor Islands. Instead of it being only on Tuesdays, Wednesday and Thursday, we also hold occasional Share the Harbor cruises on Mondays--a program that allows the general public to visit Georges and/or Spectacle with us. This would mean that the All Access team is going out to the islands more often. On Monday it was kind of weird going to the harbor islands. The whole day, I thought it was Tuesday, but then reality hit me with the fact that it was Monday from time to time. Monday was also the last time we went to Georges Island for the week. Even though I love Georges Island, I was really excited to go to Spectacle Island. Even though Spectacle doesn't have a scary tunnel to stay cool in, people are allowed to swim there which is, in my opinion, better. Wednesday was officially the first day of going to Spectacle Island and it was amazing. First of all, it was really hot and humid so taking a dip into the water felt so nice after standing in the hot sun. 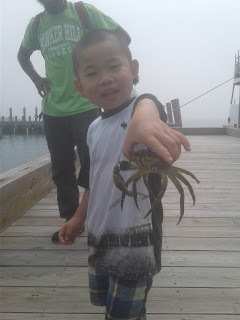 Second of all we caught a lot of crabs using the fishing rods. This is awesome because the people using the rods could feel the excitement of reeling something up instead just standing on the dock and not really catching anything. All in all, Wednesday was the most exciting day out of the whole week. Thursday was the same thing routine, but more cold. So taking that nice dip into the water wasn't so nice. Friday was the day that most of the All Access crew was at Atlantic Wharf. 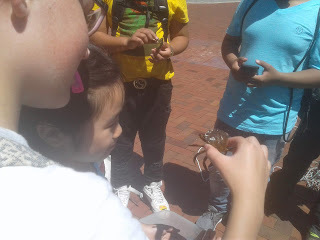 There was a similar event that happened earlier this year with Atlantic Wharf with a few groups of kids coming down. The only difference between that event and this was that this one was outside and in the warm sun and the other one happened indoors. This event had crab traps, fishing, fish printing and stories told by Tony the Pirate. The event was great with the Save the Harbor staff over at the Children's Museum lending us a Striped Bass for the campers and staff to look at. At the end of the day, we had lunch from Boloco, and called it a day. This week was different with us planning to go to the islands four times a week and me experiencing All Access being canceled for the first time. However, I think I will be experiencing more changes through the summer and when they come, I think I'll be more prepared for them.